Bushranging began in Tasmania in the early years of settlement, when near starvation meant convicts were sent into the bush to hunt. Some remained there, living by stealing from or trading with settlers. 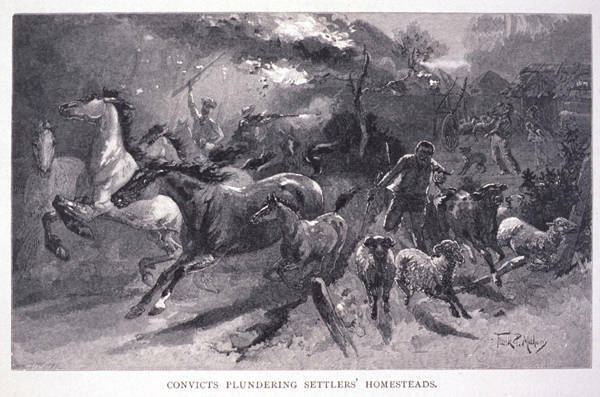 Their numbers grew as more convicts escaped, and until the 1850s there were many bushrangers. Attempts made to suppress them included a proclamation in May 1814 promising a pardon if they came in by December. Thus they could continue their depredations without fear of punishment for six months, after which many came in; some later returned to the bush. After two settlers were murdered by bushrangers in 1815, and since there was no Supreme Court in the colony, Lt-Governor Davey proclaimed Martial Law to try bushrangers by court martial. Several were executed before Governor Macquarie revoked Martial Law. Michael Howe's gang was responsible for numerous robberies and raids, but its members were gradually annihilated by death or capture. It was thought bushranging was over, but the brutal treatment at Macquarie Harbour lead to thirteen convicts escaping in 1824, and they formed a gang under Matthew Brady. In addition to the soldiers sent against the bushrangers, a force of field police was raised composed largely of convict volunteers, motivated by promises of freedom, money, free passages back home or grants of land. Soldiers and police were assisted by male and female Aboriginal trackers, such as Musquito, an Aboriginal convict from New South Wales. He was denied his promised reward of being allowed to return home, and formed his own band of Aboriginal bushrangers. Trained by their leader in the use of firearms, they became a formidable force. Musquito was shot and captured by Tegg, a Tasmanian Aborigine, but Tegg was not given the boat promised him as a reward, so he too took to the bush and led a band of Aboriginal bushrangers. No action was taken against him when he came in, but Musquito was hanged. Some settlers who fought bushrangers became popular heroes, like George Taylor of Valleyfield who captured two of the Brady gang, and Margaret Connell who overpowered a heavily-armed bushranger. Bushranging continued until the 1850s under leaders like Martin Cash; William Westwood, known as Jacky Jacky, later hanged on Norfolk Island; Timothy Driscoll, alias Dido, a former Point Puer boy; and Daniel Priest, 'the friendly bushranger', who was spared execution by the intercession of several priests and a petition signed by many country people. The most bloodthirsty was John 'Rocky' Whelan, who would shoot then rob his victims. He was hanged, but remarks made by his accomplice, Connolly, about being made a public spectacle, helped influence the abolition of public hanging in Tasmania. Bushranging virtually ceased in 1859, though in 1883 two youths terrorised people in Epping Forest by shooting dead two men and burning a cottage. Both were hanged. Some bushrangers were murderers and one used torture, but not all were violent or cruel, and they rarely harmed women. They did not rob to amass wealth, but to survive. They became bushrangers because of harsh treatment, for adventure, and in two cases to avoid debtors' prison. Others were deserters from the army or ships. There can be little doubt that the underlying reason was their desire for freedom. Further reading: R Minchin, Bolters for the bush, Hobart, 1996; The first, the worst?, Hobart, 2001; and Banditti, beware!, Hobart, 2000.